Christian Petersen/GettyConor McGregor is in police custody after attacking buses in Brooklyn ahead of UFC 223. 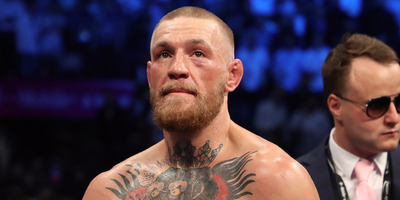 Conor McGregor is in police custody and reports say he is expected to be charged with assault after his bizarre attack at the Barclays Center ahead of UFC 223. McGregor and his entourage unexpectedly crashed a press event ahead of UFC 223, throwing objects at buses carrying fighters as they waited to depart the arena. The UFC has pulled three fights from the UFC 223 card due to the incident. UFC superstar Conor McGregor is in police custody after his bizarre attack at the Barclays Center ahead of UFC 223, according to police. Police are expected to charge him with assault, according to NBC New York. The chaos started when McGregor showed up unexpectedly at a press event for UFC 223, scheduled to take place in Brooklyn on Saturday. McGregor and his entourage caused a scene as buses carrying other fighters were waiting to leave the arena. They were seen yelling at the buses and at one point throwing a guardrail at one of the vehicles, shattering a windshield. White said in the same press conference that a warrant was out for McGregor’s arrest, but NYPD officials initially denied that fact, saying that he was only wanted for questioning regarding the scene in Brooklyn. The UFC has already pulled three fights from the UFC 223 card due to the incident. McGregor’s teammate Artem Lobov has been pulled from his fight against Alex Caceres for his involvement in chaos. Additionally, lightweight Michael Chiesa was forced to give up his fight against Anthony Pettis due to facial lacerations, and flyweight Ray Borg has been forced out of his bout due to an eye injury. McGregor had been a champion in two weight classes in the UFC before being formally stripped of his lightweight title earlier in the week. Max Holloway and Khabib Nurmagomedov are still expected to contest the now-vacated lightweight title at UFC 223.